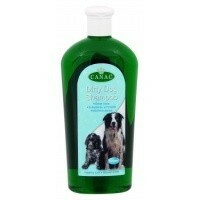 Canac Dirty Dog Shampoo 520ml is a specially formulated and mild shampoo for the regular cleaning of your dirty pooch. Made with a unique non-irritant formula this shampoo cleanses and conditions your pet's coat to leave it beautifully soft and clean. So if your dog likes a good splash around in the mud, this shampoo is perfect for bringing back their natural shine! Suitable for all breeds and ages. Once again, great value for money & a top quality product! Gives a nice lather & smells fresh (nothing fancy). My dogs' coat is shining beautifully afterwards, no irritation whatsoever.